The set for this iconic show by Klara Zieglerova was unremarkable but that was of no consequence because this was a show all about singing and what great singing we got right from the start and right through to the standing ovation at the end. Michael Watson as the extraordinary voiced Frankie Valli gave an absolutely wonderful performance. Not only did he never seem to stop singing but also as an actor he gave an equally strong and sensitive performance and was great to watch. As the man who made it all possible Bob Gaudio, a very different kettle of fish, Declan Egan also gave a strong and very compelling performance. He led the group to great success. Simon Bailey as Tommy DeVito, despite his rich baritone notes got them into a lot of trouble. A half million pound outstanding tax bill! Sure these boys earned a lot of money. They were all great singers and all on top of their game. Lewis Griffiths as Nick Massi completed the quartet supplying the bass notes. These four made the perfect combination giving us a harmony that was a perfect match for the original Four Seasons. It was quite a challenge to match the sounds of one of the best selling musical groups of all time, with estimated record sales of 100 million and members of the Rock and Roll Hall of Fame. But by golly did these boys succeed! With great songs like ‘I’m in the Mood for Love’, ‘Earth Angel’ and ‘Walk Like A Man’ we were clapping our hands and continually dancing in our seats. There were some sad and serious moments in the story all perfectly performed but in the main this was a top class feel good show. Most certainly as the audience left the theatre you could feel the feel good factor all around. And they weren’t on their own. There was some great, vibrant dancing and singing from all the wonderful supporting cast. The music for the show was provided by Bob Gaudio and the lyrics by Bob Crewe, who is also part of this story, given another fine performance by Joel Elferink. The special ingredient of ‘Jersey Boys’ the musical is that as well as being full of remarkable music it tells the story of the ups and downs of the lives of each of the four characters. Each person leaves the stage as their story is completed. The applause given to Declan Egan (Gaudio) and Lewis Griffiths (Massi) as they left underpinned the quality of the clarity and of the acting of these two and, if fact everyone else on the stage tonight. DeVito, in fact brings Valli into the group very early on, then he pushes the quartet up through the jungle of the music business until they reach the top. 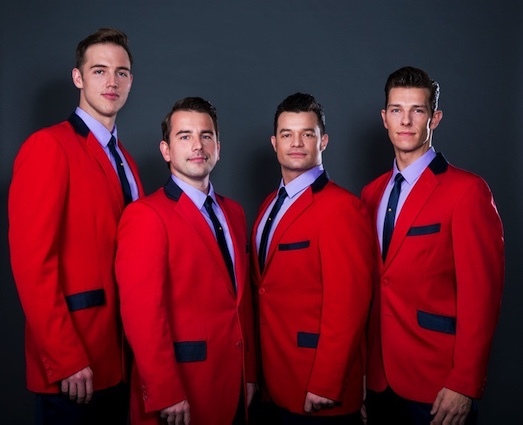 They work through many names for the group until they put on the red jackets and they become Frankie Valli and The Jersey Boys: The world’s their oyster and they served us up a wonderful exotic dish tonight.